If your vehicle has to be towed, it should be done by your Hyundai dealer or a commercial tow truck service. This will help assure that your vehicle is not damaged in towing. Also, professionals are generally aware of local laws governing towing. In any case, rather than risk damage to your car, it is suggested that you show this information to the tow truck operator. Be sure that a safety chain system is used and that all local laws are observed. Your vehicle can be towed by wheel lift type truck (1), (2) or flatbed equipment (3). o When towing the vehicle, take care not to cause damage to the bumper or underbody of the vehicle. 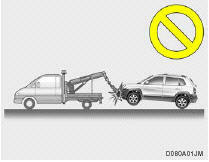 o Do not tow with sling type truck as this may cause damage to the bumper or underbody of the vehicle. 1) If the vehicle is being towed with the rear wheels on the ground, be sure the parking brake is released. 2) If any of the loaded wheels or suspension components are damaged or the vehicle is being towed with the front wheels on the ground, use a towing dolly under the front wheels. If you do not use a towing dolly, place the ignition key in the "ACC" position and put the transaxle in "N (Neutral)". 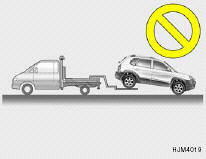 Do not tow with the key removed or in the "LOCK" position when towing from the rear without a towing dolly. o Automatic Transaxle: Be sure to use a towing dolly under the front wheels. A vehicle with an automatic transaxle should never be towed from the rear with the front wheels on the ground. This can cause serious damage to the transaxle. 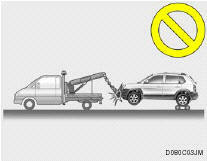 3) It is recommended that your vehicle be towed with all the wheels off the ground. When towing the 4WD vehicle, it must be towed by lifting all 4 wheels or using the towing dolly. o The 4WD vehicle should never be towed with the wheels on the ground. This can cause serious damage to the transaxle or the 4WD system.